Went weight training last night and did Back, shoulders and arms. This morning I had set up 3x12min with 3min rest on RowPro and I had decided it was time I started hitting my training targets harder from know on. I used to really enjoy negative splitting these sessions but when you follow the HR guide it makes you go slower on everyone. So I decided to ditch the HR band for this one. I noticed that my old foe David Crawford had joined the session which was going to make it very interesting indeed. Everybody has a plan until they get a punch in the face. Was going to do 3x17min but opted for the recovery instead. Joined some guys on rowpro trying for a 10k pb. You're in fine shape, Jason! I love how your 'recovery row' involves toodling along with other people trying for PB's! zootMutant wrote: You're in fine shape, Jason! I love how your 'recovery row' involves toodling along with other people trying for PB's! That is what i great about RowPro. You never know who is going to be there, sometimes i am somebody elses recovery row. Having a few training "issues" so i will be a bit quiet for a while. But will be back soon though. Just need to sort something out. Back to the plan after 5555m at r22 yesterday night. 1:49.9 pace. The plan said 2x6min with 2min rest. Pace guide was 1:45-50 but it looked very soft as my 5k pace is about 1:42-43 at the moment. So i just went on feel. First time i have gone gone fast in 4 weeks with all the UT1. 3x12min with 3min rest today on my own without RowPro. Target pace was 150-55 but as always i like to chase the pace and negative split these sessions. 2x7min at AT today. Seemed to easy so I added a bit of cross training. 11x500m with 2min rest at r23. Average pace 1:44.3. I did sit ups and push ups in between every rep, real sweat fest. The plan said 3x15min but I noticed a 10k on RowPro. So I opted for the 10k at a nice steady UT1 1:50-55 pace. My body is responding well to weight training and I feel good. Todays session said 3x12min at UT2 but today felt like a UT1 day inside. 2k cd. Job done nice and easy. Opted for a 30min cruise with a cold last night. Thanks to the kids. I am still alive....just. I have had the dreaded ICK for the last 3 days and just been plodding along outside in the sun. Vitamin D seems to be curing me. 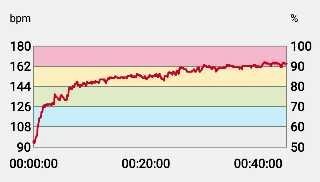 After the first week of the prescribed sessions, my pace, while staying within the prescribed HR, is much closer to 2:02 than what to what is mentioned above. Is this, then, more of a guideline, or just a general indicator that I am entering a 2000m time into the calculator that is much slower than what I am realistically capable of? 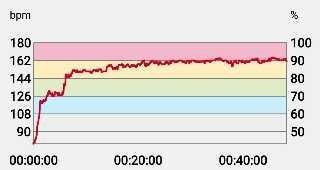 I'm beginning to think I wasn't pushing it hard enough when I did that 2000m... perhaps I just needed the structure. Both me and Matt had the same problem when starting the IP. 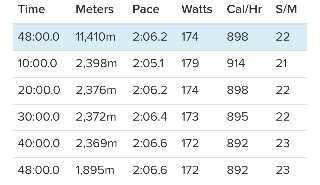 (We were both over pushing the UT1 sessions) I never used a HR monitor when i first started so i used to pick the fastest pace and then negative split the 2 or 3 UT1 sessions. But because you are rowinig with your HR i would row at 2:02 if that is what your HR says. Just be careful when you step up to the AT and TR stuff and re-check your 2k again. Keep at it Jason - it's doing you good. "When the crazy wheel slows down, where will I be? Back where I started!" hewitt wrote: Both me and Matt had the same problem when starting the IP. 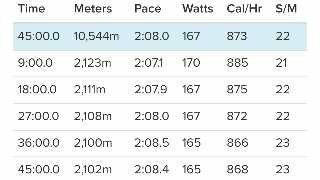 (We were both over pushing the UT1 sessions) I never used a HR monitor when i first started so i used to pick the fastest pace and then negative split the 2 or 3 UT1 sessions. But because you are rowinig with your HR i would row at 2:02 if that is what your HR says. Just be careful when you step up to the AT and TR stuff and re-check your 2k again. That's pretty much what I was thinking. It's good to know others have had similar experiences. Because I've only been back on the erg for a month after a wee layoff, I will most certainly be careful with the TR and the AT stuff (or as I call it, the AT-AT). Know your limits, eh? The advice is much appreciated! Thanks again! Having begun my serious 2k training on the IP back in 2005 I have been looking for it again (as it really works to improve base fitness (and 2k time)). However, I can't find any links that show any suggested training schedules. Am I looking in the wrong places, or does it just not exist any more? I think this might be the one. If you download the full version it is on page 5.14. Thanks for bumping this thread, and also to Max for the link. Looks a nice schedule of sessions. Given my 2km is pretty weak, the first week in the 5 day, 2km plan is quite restful, in fact more of a mental challenge to try to stick to the (for me) low s/m required. Exhibit a: evidence of being unable to hold 22 s/m for 45 minutes. I'm finding that the main bump in the road between the Pete Plan and this is the - admittedly small- extra length of time needed. Going from around 45 minutes to an hour will really test once I'm a bit further along the plan (assuming my 2km time does improve....).